Renowned journalist Tom Brokaw admits on page four of A LUCKY LIFE INTERRUPTED that "The conceit of a long, lucky life is that bad things happen to others." In all his years of covering and reporting the news, perhaps he felt immune to bad luck. After all, he enjoyed a stellar career accompanied by a sweet paycheck, instant recognition around the globe, a solid and happy marriage, and accomplished daughters. One could say Brokaw had it all, and that certainly would be a fair assessment. At first, he sloughed off his nagging backaches and accompanying discomfort as side effects of a very active lifestyle and too many hours spent airborne. Back pain eventually sent him to his doctor’s office seeking relief, which was not exactly what he found. In its place was very unwelcome news. Brokaw’s lucky life was rudely and abruptly interrupted with his diagnosis of multiple myeloma, a treatable but incurable form of blood cancer. He quickly became one of the millions of patients diagnosed with "the big C." Cancer is an ugly word to hear, and an even uglier diagnosis to receive. 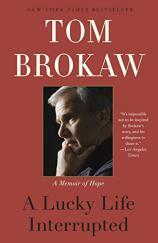 "Ever the reporter, a seeker of facts, Brokaw decided to journal his illness and its treatment. A LUCKY LIFE INTERRUPTED is the result of his insightful observations." Brokaw had the resources and connections to seek out the very best medical care, which he did. He researched multiple myeloma, relied on the expertise of his physician daughter Sarah, and sought out and received the very best medical care available in the United States. A team of specialists from various medical institutions participated in his care. It was only natural for Sarah to be his advocate, as she knew what questions to ask and how to interpret the test results. Fatigue, loss of weight and appetite, numerous tests and procedures, decreasing height, exhausting, body-assaulting chemotherapy --- all of these things became part of his now sidelined, daily life. Suddenly, this vital, active man became one more cancer patient, dependent upon the wisdom, education and experience of the medical community. He looked for hope in the numbers, and the results of lab reports would tell if the treatment was working well. Ever the reporter, a seeker of facts, Brokaw decided to journal his illness and its treatment. A LUCKY LIFE INTERRUPTED is the result of his insightful observations. Details of his lengthy treatment and recovery are fully explained. He learned that "[c]ancer has its own calendar and insidious rhythm." And he is always reminded that his cancer is incurable. The book also describes world events as Brokaw experienced them: the fall of the Berlin Wall, the horror that was 9/11 and Nelson Mandela's release, among many other topics. He draws upon his vast pool of life experiences, which is what forms his perspective. At age 75, Tom Brokaw feels well and is actively traveling --- promoting his book and savoring life. He has been through a major battle and has survived to tell about it. He looks ahead to the future with hope, ending his powerful and courageous memoir with this: "Life. What's left. Bring it on."